Precise time measurements play a vital role in our daily life. They allow reliable navigation and accurate experimenting and provide a basis for world-wide synchronized exchange of data. A team of researchers of PTB Braunschweig, Ludwig-Maximilians-Universität München (LMU), Johannes Gutenberg University Mainz (JGU), the Helmholtz Institute Mainz (HIM), and GSI Helmholtzzentrum für Schwerionenforschung in Darmstadt now reports on a decisive step toward the potential development of a nuclear clock, which bears the potential to significantly outperform the best current atomic clocks. The only known excited state of an atomic nucleus that is located at a suitably low excitation energy to be accessible by optical techniques, as they are in use in current atomic clocks, exists in thorium-229. Fundamental properties of thorium-229 in this state have now been determined, the researchers report in the current issue of the journal Nature. Some 15 years ago, researchers at PTB in Braunschweig, the National Metrology Institute of Germany, developed a concept for the design of a novel optical clock with unique characteristics. Instead of exploiting oscillations in the electron shell, they proposed that one could make use of a transition between energy levels within an atomic nucleus as the basis for a nuclear clock. Because the protons and neutrons in the nucleus are orders of magnitude more densely packed and much more tightly bound than the electrons in the outer electron shells, they are much less susceptible to perturbation by outside forces that might affect their transition frequencies. Therefore, a nuclear clock should be far more stable and precise than present-day optical atomic clocks. However, the typical frequencies of nuclear transitions are much higher than those that occur in electron shells and generally lie in the gamma-ray region of the electromagnetic spectrum. This means that they cannot serve as the basis for an optical atomic clock, as all such clocks are based on excitation by microwaves or laser light. The exception to this rule is found in an unstable isotope of thorium, thorium-229, which exhibits a quasi-stable, so-called isomeric nuclear state with an extraordinarily low excitation energy. The frequency of the transition between the ground state and this isomeric state corresponds to that of ultraviolet light. 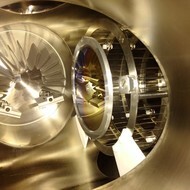 This transition can therefore be induced by means of a laser-based technique similar to that used in state-of-the-art optical atomic clocks. 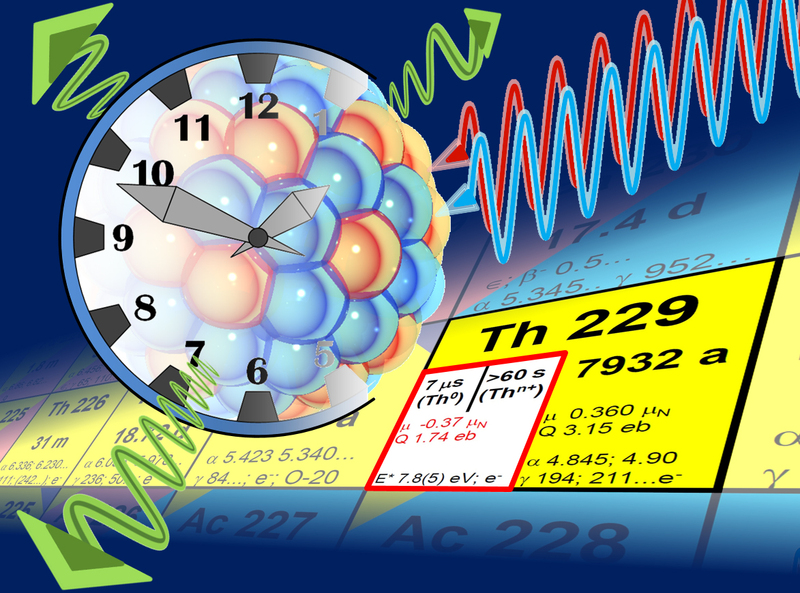 More than ten research groups worldwide are now working on the realization of a nuclear clock based on the thorium-229 isomer. Experimentally speaking, this is an exceedingly challenging endeavor. While the existence of the state was inferred from data obtained over several decades, the direct detection and hence unambiguous proof of its existence in the first place was achieved in 2016 in collaborative work of the LMU group together with the groups in Mainz and Darmstadt. They subsequently succeeded in measuring its half-life. However, it has not been possible to observe the nuclear transition by optical means yet, as the exact excitation energy of the isomer has not been determined with sufficient precision. The transition itself is extremely sharp – as required for timing purposes – and can only be induced if the frequency of the laser light corresponds exactly to the difference in energy between the two states. The quest for the magic frequency may be compared to the proverbial search for a needle in a haystack. A collaborative effort by researchers and engineers at PTB, LMU, JGU, the Helmholtz Institute Mainz, and GSI Helmholtzzentrum für Schwerionenforschung has now achieved an important breakthrough in this search. The researchers have now measured some of the basic features of the thorium-229 isomer, such as the size of its nucleus and the general form of the distribution of protons. In the present study, the nuclei were not excited from the ground state by means of laser light, as they would be in a future clock. Instead, the isomer was produced by the alpha-decay of uranium-233 and decelerated in a device developed at LMU, extracted, and stored in an ion trap as Th2+ ions. The uranium-233 source was provided by the groups in Mainz und Darmstadt. For this purpose, uranium-233 was chemically purified and its decay products were removed to avoid any influence on the measurements. Subsequently, suitable sources were deposited as homogenous thin films on a silicon layer in an electrochemical procedure for the laser experiments of PTB at the LMU apparatus. Christoph Düllmann, professor at the Institute of Nuclear Chemistry at Johannes Gutenberg University Mainz and head of the involved research teams at HIM and GSI, said: "This is a fascinating interdisciplinary team of physicists and chemists studying a topic that connects nuclear and atomic physics. Our contribution is testimony to the need of nuclear chemistry expertise in the preparation of samples suitable for experiments in a variety of fields in contemporary physics and chemistry research." With the aid of laser systems specifically developed for spectroscopic analyses of this ionic species at PTB, researchers have now been able to determine the transition frequencies in the electron shell of Th2+. These parameters are directly influenced by the state of the nucleus and encode valuable information on its physical properties. On the basis of theoretical modeling alone, it has not been possible to predict how the structure of the thorium-229 nucleus in this unusually low-excited isomer might behave. Professor Thomas Stöhlker, Vice Director of Research and head of the Atomic Physics division at GSI, added: "These fantastic new results are very helpful to determine the energy of the transition of Th-229 in future experiments at the storage rings of GSI and FAIR with high precision." Furthermore, it is now possible to probe the structure of the electron shell to confirm a successful laser-excitation of the nucleus into the isomer. The hunt for determining the optical resonance frequency that triggers the transition to the isomeric first excited state of the thorium-229 nucleus is not yet over. But researchers now have a far better idea of what the needle in the haystack really looks like. The uranium-233 source (large disk in center of image) produced at Mainz University mounted inside the experimental apparatus at the Ludwigs-Maximilian-University Munich. Components of the setup are reflected in the surface of the source. Research program "Superheavy Elements / SHE Chemistry"